Birmingham; Friday, February 23, 2018. 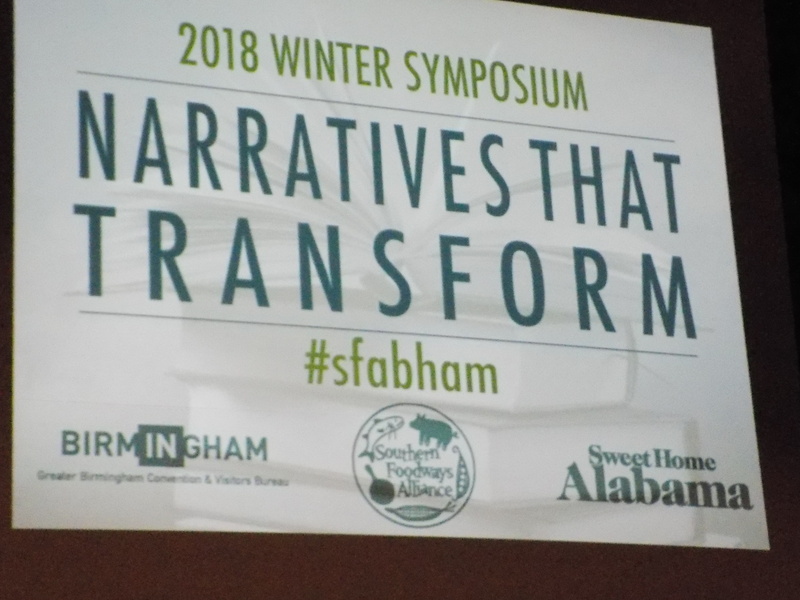 The Southern Foodways Alliance 2018 winter symposium, “Narratives that Transform,” began its narrative on Friday night with a reception on a loading dock behind a chain-link fence at an apparently abandoned building in an industrial district near the edge of downtown Birmingham (www.southernfoodways.org). Although it is late February, it was a balmy evening with temperatures hovering in the 80s all day. I drove past the place twice to be sure I had the right address. When I parked the car and got out, the aromas drew me in to what was already a bustling gathering in progress. Grills were smoking and guests were gathered around picnic-style tables, creating a convivial spirit that enlivened the surroundings. 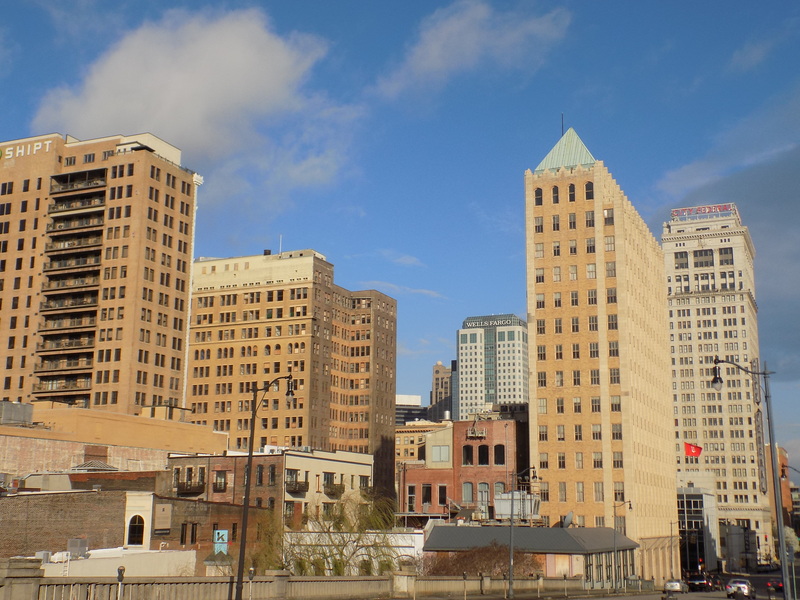 The ragtag location is the future site of chef Adam Evans’s new Birmingham restaurant that will open later this year. I first had Adam Evans’s food at a Friends of the Café dinner at the Alabama Chanin factory in Florence in August 2016; I still remember that evening as one of the best meals I have eaten at that venue. The rumor was already circulating back then that Evans, a Shoals native who had recently left The Optimist in Atlanta, was contemplating a “new concept” in Birmingham and I have been regularly checking for news ever since. At the reception Evans’s pass-arounds included Gulf clam chowder, Gulf oysters, and salt-baked fish. It all lived up to my expectations. Saturday morning, February 24, 2018: When I told my mother that I would be spending most of the day at a food symposium in downtown Birmingham, she asked, as she is wont to do, how much I was paying for the event. The symposium venue was WorkPlay, the southside multi-purpose entertainment and work facility where food professionals, writers, and enthusiasts gathered for a packed day of presenters and food. 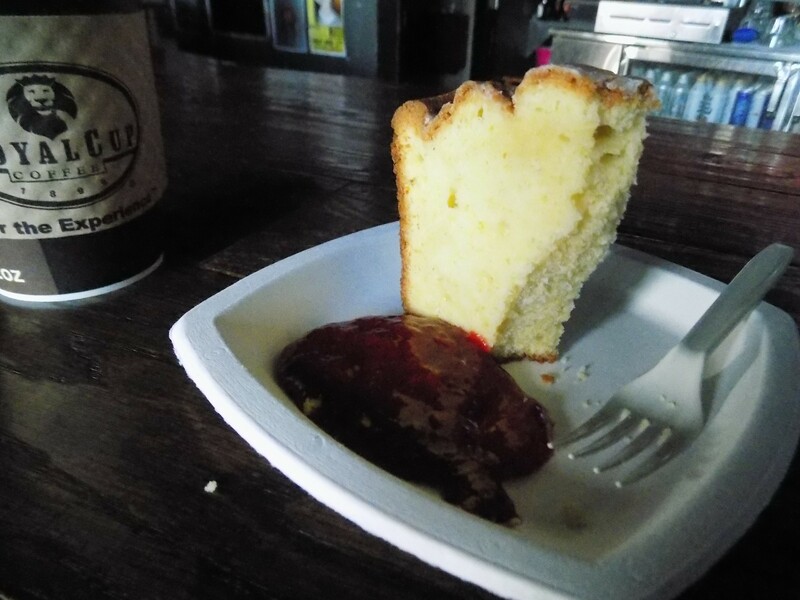 As participants arrived early on Saturday morning, Royal Cup coffee was being served on the WorkPlay sidewalk and Dolester Miles was plating up her cornmeal cake with strawberry preserves in the lobby. Ms. Miles is the James Beard-nominated pastry chef for chef Frank Stitt’s family of Birmingham restaurants and her dessert offerings are things of beauty and exquisite taste. I ran into my friend, reporter Bob Carlton, who introduced me to Rusty Tucker, the force behind Rusty’s Bar-B-Q in Leeds, Alabama (www.rustysbarbq.com).The three of us sat together for most of the event. I have not been to Rusty’s, but I remembered him as one of the featured pitmasters in the documentary Q: Alabama’s Barbecue Legends that aired on Alabama Public Television and PBS. After hearing Tucker’s take on food and particularly barbecue throughout the day, I plan to make it a priority to drive over to Leeds to check his place out soon. 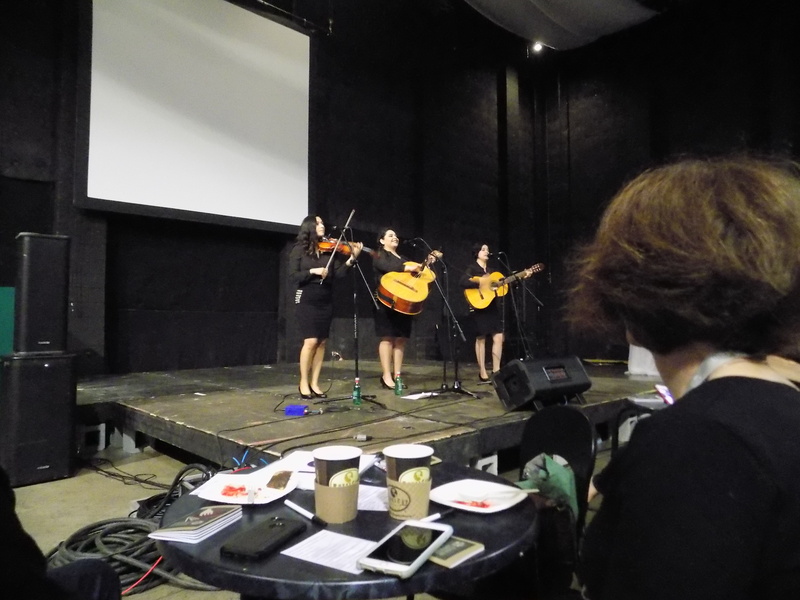 After breakfast, the gathering assembled in the WorkPlay soundstage for “Morning Corridos” – narrative protest ballads performed by La Victoria, a three-piece all-woman mariachi band based in Los Angeles. As they travel, the musicians meet with immigrants in each location, compiling stories and creating new corridos for each locality. With Birmingham-based Latino activists and residents on the stage, they performed “Heart of Alabama,” their newest ballad of Birmingham. It was a good way to wake the audience. Saturday afternoon, February 24, 2018: An appetizer, of sorts, before the lunch service, was a preview screening of Ava Lowrey’s short SFA film, “Dol,” about Birmingham pastry chef Dolester Miles. The lovingly shot film, to be released in March 2018, is deliberate and sumptuous in its presentation of Miles’s techniques and of her food that always looks as wonderful as it tastes. Among her many desserts over the years, I still particularly savor the memory of her Bastille Day cake I had at Chez Fonfon years ago. Miles has been with Frank and Pardis Stitt’s restaurants since 1982 when Highlands Bar and Grill opened. After the “Dol” screening, a generous “Family Lunch without Tweezers” was served by Duane Nutter of Southern National in Mobile. Southern National is a semi-finalist for the James Beard Foundation’s 2018 Best New Restaurant award. 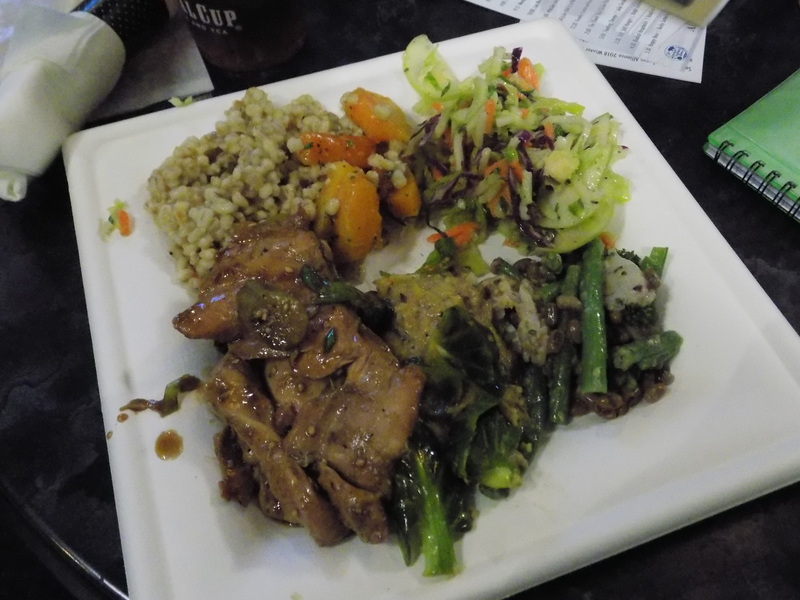 The meal included Kung Pao chicken breasts and a pea and Gulf shrimp salad along with a preponderance of other sides – a packed plate of delicious, hearty food. David Hagedorn, a Washington, D.C.-based writer on food and dining, was born in Gadsden, Alabama, and summered at his family’s house on nearby Lake Guntersville. His presentation, “The Thank You / Screw You Paradigm,” ultimately seemed to be questioning the efficacy of exploiting and exalting his Southern heritage in his food writing and expertise, when he is so ambivalent about the South as it relates to his identity as a gay Jew from a prominent Southern family. His narrative was hilarious and heart-breaking – sometimes simultaneously; his bitterness was tempered with affection, generosity, and clarity. During the Q&A that followed the talk, an undocumented woman, also from Gadsden, asked Hagedorn about his prognosis for Gadsden’s future. 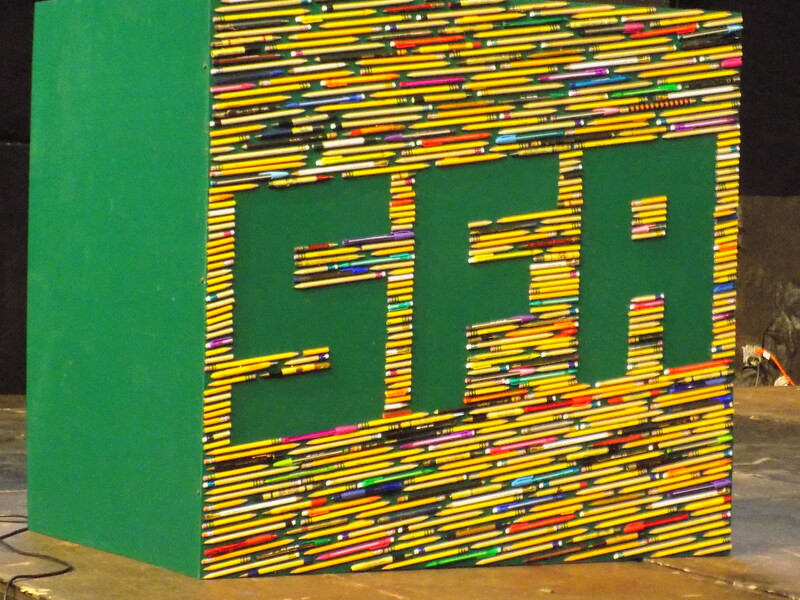 His response was empathetic but grim, prompting SFA executive director John T. Edge to say, to Hagedorn, “I’ll claim you if you’ll claim me.” Alas, Hagedorn sighed but had no ready response. 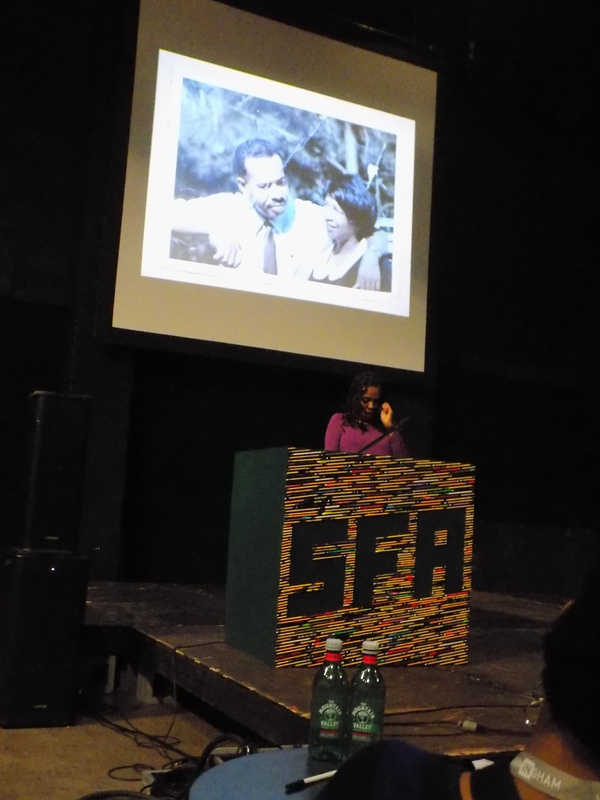 Writers and scholars Ralph Eubanks and Tom Ward presented “Still, Still Hungry,” in which an upcoming reissue of Still Hungry in America, a 1969 book featuring photographs by Al Clayton and a text by Robert Coles, was discussed. The book grew out of Lyndon Johnson’s “War on Poverty” and Clayton’s photographs provide stark evidence of the dire poverty of areas of America including Appalachia and the Mississippi Delta. The session was introduced by Clayton’s daughter and the presenters provided sobering contemporary evidence of the ongoing blight of American poverty and the government’s failure to confront it effectively. The final presentation, by Rosalind Bentley, a reporter for the Atlanta Journal-Constitution, was a master class in how to present transformative narrative. “Radical Hospitality” was a memoir of Bentley’s relatives and role models – Aunt Lucy, Cousin Carol, and Sandra, women who each participated in her own way in the Augusta, Georgia, chapter of the 1960s Civil Rights Movement. Aunt Lucy and Cousin Carol “fed the Movement” with home-cooked meals for the activists and their attorneys. Sandra “fed the movement” as a teenager jailed for marching, who shared care packages from her family with her fellow political prisoners. Bentley built her narrative with care, seasoning it with the perfect amounts of humor and family stories, and building to a powerful climax and conclusion which provided the ideal resolution for a deeply felt and moving day of food-fueled activism. As the day ended, Becky Satterfield and her crew from Satterfield’s, a Birmingham restaurant, were in the lobby serving a Conecuh County sausage gumbo as part of the event’s closing happy hour. The 2018 SFA symposium is over, but its narrative, which began at the make-do reception on the loading dock, will end in a year at a reception at the same spot to launch the 2019 winter symposium. Next year, however, the site will have transformed into Adam Evans’s spanking new Gulf seafood restaurant and oyster bar. The narrative of southern food and foodways is always, after all, a continuing saga. This entry was posted in Southern Foodways Alliance 2018 Winter Symposium and tagged Al Clayton photographer, Alabama, Ava Lowrey, Becky Satterfield, Birmingham Alabama, Chef Adam Evans, chef Duane Nutter, Clay Risen, corridos, David Hagedorn, Dol documentary, Fawn Weaver, Frank and Pardis Stitt, Highlands Bar and Grill, Jack Daniel, Jack Daniel's whiskey, John T. Edge, Julia Turshen, La Victoria mariachi, Moni Basu, Narratives that Transform symposium, Nearest Green master distiller, Pastry Chef Dolester Miles, Pitmaster Rusty Tucker, Q: Alabama's Barbecue Legends documentary, Ralph Eubanks, Robert Coles, Rosalind Bentley, Rusty's Bar-B-Q, Satterfield's restaurant, Southern Foodways Alliance, Southern National restaurant, Still Hungry in America, Tom Ward on March 1, 2018 by gedwardjourney.